If you want to stay around the North West when you graduate (and I know a lot of our postgrads do), it’s easy enough to find companies with a presence here – just look in the phone book. However, if you want to weed out the “one man/woman and his/her dog/cat” (choose your own cliche) operations and focus on those where the decision making power lies in the North West, you need companies which are headquartered here or have “a significant controlling head office presence”. And would I be blogging about this if I didn’t happen to have just such a list, tucked under my virtual arm? Exactly. So, in a big Liverpool/Manchester love-in, the Liverpool Daily Post and the Manchester Evening News have got together with MBA students from the University of Liverpool Management School and produced “The North West Top 200”, both in print form and online (it’s also available in “magazine view” where you flip over the pages – can’t stand that format myself). It focuses on companies which have at least some of their executive board members based in the region, so whilst some of them are headquartered elsewhere in the world, you know that at least some of the major decision making is taking place within reach of Manchester. There are all sorts of “pockets of power” around the region, for example with Chester being strong in financial services and the industrial estates of Warrington hosting a surprisingly large number of HQs (17, in comparison to 18 for Liverpool and 22 for Manchester). So, what you all want to know is, which high tech thrusting industry or business service is at number one in the region, burying forever that northern stereotype of heavy industry and hard toil? If you’re working in a specialist field but want to move out of academia, how do you find those niche hi-tech companies who will really understand and value your postgraduate expertise? One strategy is to look at science parks or university spin-out organisations – the closer the company is to university research, the more likely they are to recognise what you’ve got to offer, and to be working on cutting edge research or services. They’re also likely to have other postgrads or former academics working for them, so they’ll automatically understand why employing a postgrad is a good thing. They can be hard to find though, particularly if they’re very new and have a website more focused on promoting themselves to customers or venture capitalists, rather than any careers info. Oops! The Innovation Park Search website seems to have been hacked. Don’t go searching for it – it’ll infect your PC with a trojan! I’ve alerted UMIP, removed the links in this blog post, and I’ll resurrect this post once it’s fixed (it’s really useful so hopefully it’ll be fixed soon). However, UMIP, University of Manchester’s Intellectual Property commercialisation company, have a great search engine, Innovation Park Search, designed to search the research web pages of companies based on UK Science Parks and Incubator facilities. You are unlikely to find job adverts this way, but you could find companies to whom you could send a speculative application. Try your particular specialism in the search box, and see what comes up. What, you want more lists of employers? OK, this is the daddy of them all – but it takes a bit of work to get to what you want. Our wonderful John Rylands Library has a subscription to a database called FAME. Nothing to do with leg warmers, the Man Who Sold The World or X-Factor wannabes – it’s a database of almost 2.5 million public and private companies in the UK and Ireland. You need to be on campus to access it without a password, or if you’re off campus, just use your usual University of Manchester login. You can search on factors such as industry classification, location and number of employees (in total or at a particular trading address). You can then get a list of all companies which match your search criteria, contact details, including website where they have that information, plus loads of financial info (that’s what it’s really designed to give you). One limitation is that the categories can be a bit old fashioned (OK, positively antique at times). For example, there’s a category of “manufacture of coke oven products” – but not bioinformatics. 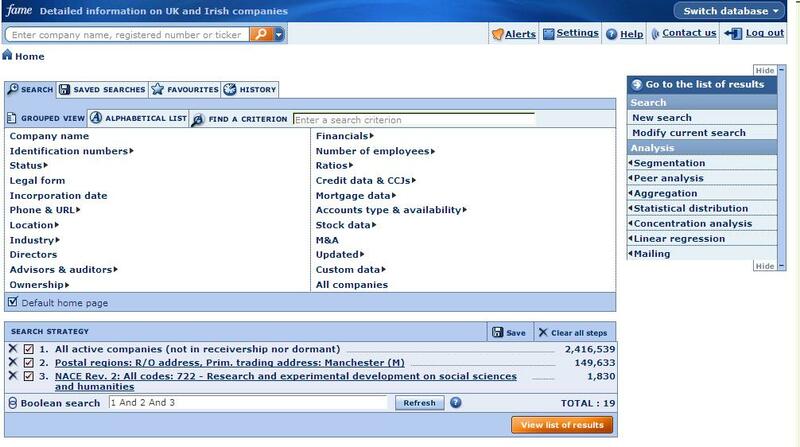 However, you can do a keyword search, although bioinformatics still only comes up with 4 companies. (In practice, if you are after bioinformatics employers I’d start here, or for jobs in the UK, this is quite handy). You don’t get any idea of whether they are recruiting or what exactly they do, but it does give you some useful target organisations to investigate. Interestingly, it also gives you details of directors, where applicable – depending on the size of the organisation, this may also give you a name to write to speculatively. So, next time someone asks me, “Do you have a list of large employers in the agrochemicals sector in Norfolk?”, I know where I’m going to tell them to go. I’ve just declared it “Lists of Employers Day” here at the Manchester Postgraduate Careers Blog, so here’s another handy summary of jobs to apply for – Graduate Scheme Closing Dates 2010/2011 (pdf download). If you’re planning to apply for jobs in the City, hopefully your applications are already well under way. 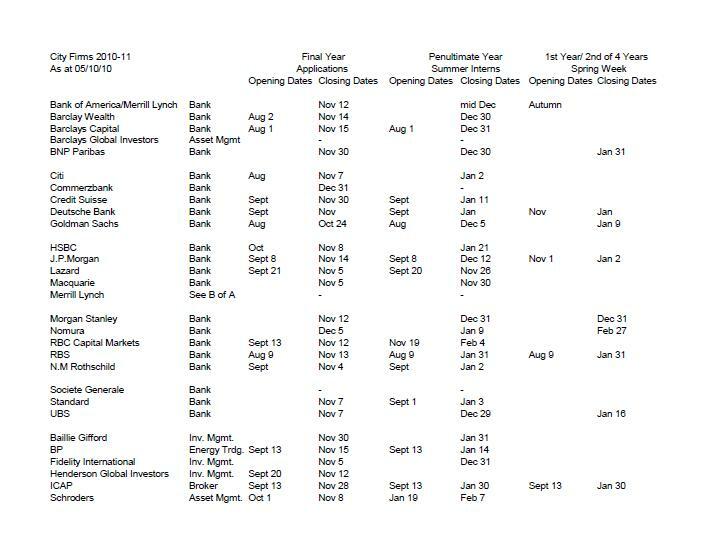 If not, or if you’re holding out until after you meet some of the banks at the Finance, Business & Management Fair on Thursday, you should check out the following summary of the opening and closing dates of City graduate and internship programmes (pdf download – or see image below). Our constant refrain this year is: “Don’t leave your applications until near to the closing date”. Many recruiters are starting to review applications as soon as they come in, and if they get enough good candidates applying early, there won’t be any jobs left to offer by the time the deadline approaches. So get to it … now. I know lots of postgrads are keen to stay in the Manchester area. If you already have deep roots here or have just come to love living in the North West (or let’s be honest, to love someone who lives here), we’ve got some new resources to help you decide where to live and how to find work. Our World of Manchester interactive map looks beyond the Oxford Road corridor, and gives you a quick insight into what’s on offer within commuting distance of the city centre. It goes as far as High Peak (in Derbyshire) and Cheshire (no, they’re not too far – I’ve lived in both, so I know they’re easily commutable). The “Working here” part of the “World of Manchester” site gives some very brief info on the main types of employment. However, if you want more detail (and for those areas you want to seriously consider, we realise you will want more than this overview), just click the “Finding work” link at the top of the interactive map . This will get you to the detailed Manchester and the North West section of our Careers Service website. There have been announcements this week from both AstraZeneca and GlaxoSmithKline about increased profits – and large scale restructuring and redundancies. These companies are both major employers of researchers so this will have caused dismay for many of our postgrads. Reports still coming in sound grim, whatever way you spin it, with uncertainty over which plants will close (including R&D plants at AZ) and locations of redundancies not yet released. We’ll need to hold our breath to see the impact on the massive AZ R&D site at Alderley Edge and their Macclesfield manufacturing plant. As ever though, there isn’t a simple story of “no jobs in pharma”. On Chemistry World, part of the Royal Society of Chemistry website, a spokesperson for AZ is reported as pointing out that although they have announced reductions in headcount of 15,000 since 2007, with a further 8,000 just announced, in the same timeframe they have also created 8,000 positions in areas such as biologics. It’s not just research and manufacturing jobs which are at risk. The Financial Times points out that in the Western world generally, there is a move to more centralisation of decision making about prescribing drugs (eg. NICE in the UK and health insurers elsewhere) with individual doctors having less scope to make their own prescribing decisions. This means fewer marketing and sales staff will be needed. On the other hand, Computer Weekly pointed out that as both GSK and AZ had largely outsourced their IT functions, these would be unlikely to be as badly affected as other functions by the job cuts. Some common patterns have emerged over the years. The massive pharmaceutical companies have been moving from employing their own R&D scientists directly, towards scanning the horizon and developing collaborations or licencing deals with small, nimble high-tech drug discovery companies. These SMEs (small and medium enterprises) may have been spun out of universities or be closely located to other small research companies, often on science parks. The recent announcements from AZ seem to point to an acceleration of this strategy, but it’s happening all over. This means that if you want to do cutting edge drug discovery or related research, you may be better targeting the small company (possibly on your doorstep) which you didn’t realise existed, rather than the large, supposedly “safe” corporation which everyone has heard of. Where are all these small high-tech bioscience companies? Luckily, we have a cluster of them in the North West of England, and an organisation, BioNow to support and promote them. BioNow has an interactive map of biotech companies in the region, and we’ve got our own Careers Service list of local bioscience employers (pdf). Further afield, the Association of the British Pharmaceutical Industry has a database of pharma companies, also categorised by region, on their excellent careers website. So, no-one’s going to kid you that it will be easy to find a job in the pharmaceutical sector, but if you modify your job search strategy, you might still strike lucky. And after all this, we got two more prompts this week from GSK to remind us that they are still recruiting for their Graduate development programmes in Science (as part of Global Manufacturing), Engineering, Health Outcomes and Finance. Closing date – Friday 12th February. Just to prove that I’m not fixated on chemistry (got that out of my system a looooong time ago), if working in government, the public sector or other regulatory bodies is more your thing, and you want to stay here in the North West, we’ve got a list for you too – all here in a pdf. It includes links to regional and local government websites, and links to those parts of the Civil Service which have offices in the North West of England (though the links are generally to the main website – they won’t normally have a direct weblink about their NW offices). Some of the “other and regulatory bodies” with presence in the NW include the Equality and Human Rights Commission, Charity Commission, the Information Commissioner, English Heritage and the Audit Commission. Finally, there are links to Health related organisations. This obviously includes local NHS Trusts, but it also includes the General Medical Council, NICE, Parliamentary and Health Service Ombudsman and the Health Protection Agency. The document also includes a link to the Civil Service recruitment portal, which allows you to filter jobs by region. However, for non-Civil Service jobs, another resource which might help is a website which gives direct links to the jobs pages of government and “other publicly funded organisations” – Government Jobs Direct. We’ve got loads of other resources on employers in the North West or in specific occupational sectors, but they’re all being reorganised at the moment, so I’ll do another post to highlight what’s there, once they’re ready to be relaunched. Note: This post is a few years out-of-date and we’re currently (April 2012) updating our list of chemical companies in the North West. If you’re reading this in 2012, you might want to check the blog in a few weeks for the new version! Yes, I know the last post was also for chemists, but I was asked yesterday to update our list of chemical companies in the North West of England, so before it goes on our website as a pdf, I thought I’d let you see it as a Word document – TheChemicalindustryintheNorthWest. It’s not meant to be an exhaustive list, but I do try to make sure that the companies mentioned are more than just a sales or distribution arm of a larger company, and that they employ more than 3 people in the North West. Some of the companies listed have full blown research labs in the North West, though many more have manufacturing plants. As manufacturing plants are potential sources of jobs for chemical, mechanical and electrical engineers, as well as chemists who are interested in process development or quality assurance, I make no apologies for including them on the list (plus I still have a soft spot for companies who make things, from my own time in manufacturing). I’ve tried to make it clear on the list which are research labs and which are manufacturing plants but if you spot any errors, please do drop me a comment here so I can change it. I should point out (though it should be obvious!) that it’s not a list of who currently has vacancies. However, if you have a specialism which might be in line with a company’s work, you could keep an eye open for ads from the company, consider making a direct speculative application, or see if you know anyone in the company who you could talk to as a contact.